Fishing for enjoyment and fun is an excellent activity. Whether you are with friends or family members you can be sure to enjoy yourself with a stress-free deep sea fishing trip, especially in Myrtle Beach. You may even get a little competitive! The social aspect and exposure to nature are a few reasons why you should go deep sea fishing once in a while. But, possibly you are looking for something a little bit more … adventurous. If you are looking to roam further into the ocean, stray away from your common bass and trout catches and dive into the darkness of the dark surfaces of the ocean, who knows deep sea fishing might be for you. What Is Deep Sea Fishing? Deep sea fishing is a far more complicated kind of fishing. As the name suggests, it requires a trip to the deep seas, which lie far away from land. Often referred to as sport fishing. When you venture out to these deep seas, you travel far from the shallow waters of basic fishing. Here, it is a totally different fish scenario. Think about it, where do sharks swim? Deep seas. A broad variety of fish types can be found in the dark deep seas. Possibilities are endless with this design of fishing and will produce an extremely pleasurable journey. Calm waters situated a short trip from land, occupied with a variety of species year round, is the seas you want to find. Whether you are a fishing newbie or consider yourself a sports fishing master, this will be the most suitable environment. As a sports fishing lover, you desire seas complete with every species A-Z. By doing this you can discover new, different and wild fish every time. Perfect for competitive fishermen, who want to fish for the unusual catch! Famously known for their Blue Marlin, the South Carolina waters are the best location for newbies and skilled deep-sea fishers. 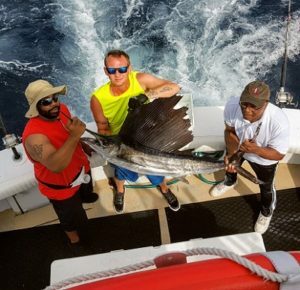 If you are aiming to capture the big kahuna, compete in a competitors or just delight in the experience of looking for something to grill, Myrtle Beach has ample chances for you to use. 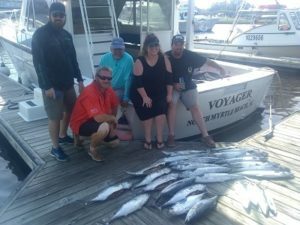 It is encouraged that you engage the expertise of a fishing charter when going to Myrtle Beach, to guarantee the very best experience possible. There are a range of options offered, from half days, 3 quarter days and even a full day if you prefer. Whilst on board these exclusive charters you will not require your own fishing license. Tackle, bait, and ice will all be included in your package. All your fishing needs will be covered, and you might even get lunch and beverages depending upon your option. With up to 6 people per charter, renting a boat can provide your family or friends with a day filled with fishing fun. Possibly you want to host a private occasion with your good friends on other boats? No problem! You can be sure to get excellent cooperation on these charter deals, to optimize your Myrtle Beach deep sea fishing experience. Now, on to the fish. These are totally different than your regular shallow water fish. We are talking big video game fish– Grunts, Triggerfish, Grouper, Large Sea Bass, Porgies, Amberjacks, Pink Snappers, Rudderfish, Big Cobia, King Mackerel & Mahi Dolphin are being captured on drift lines. You generally will not find these species closer to coast, as they need open and deeper waters to feed. The swimmers and surfers are definitely delighted about that. Call us today to schedule your deep sea fishing adventure of a lifetime.